So snowed under with email that you can't find the good stuff any more? Newsfeeds are the solution. With newsfeeds we don't send you anything, you just pull the latest issue down when you want to read it. Your web browser or newsfeed reader automatically checks from time to time to see if the latest issue is available. To subscribe to a newsfeed in Firefox click the small orange button in the address bar (or the bottom right corner). Select Add DOMestic as a Live bookmark from the pop-up menu and then select the bookmark folder (toolbar). Add a live bookmark to the Toolbar, and it will display as shown in the following graphic. You can also hide them away with your other bookmarks. In IE7 if there is a "Feed" available for a page you are visiting, then the "Feeds" icon will be displayed in orange. 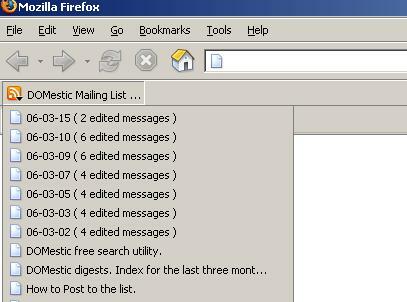 To subscribe to a newsfeed in Internet Explorer you can click the small orange button in the "Command Bar", shown in the image. However if there is more than one "Feed" for the page, as there is for DOMestic, then it's best to click the tiny black down arrow to the right of the "Feeds" icon to choose the feed you want as shown (above right). Once you've joined some "Feeds" you can access all your Feeds (or your Favourites) by clicking on the star icon shown on the left. Internet Explorer checks throughout the day and updates the "Feeds" listings for all your subscribed "Feeds". DOMestic is also available free by email as a daily edited Digest from Yahoo! Subscribe below.